We are excited to roll out our newest print product. Birth announcements. I received something like this in the mail not to long ago from a friend of mine. It was really sweet getting to see the baby even though I'm kinda far away. 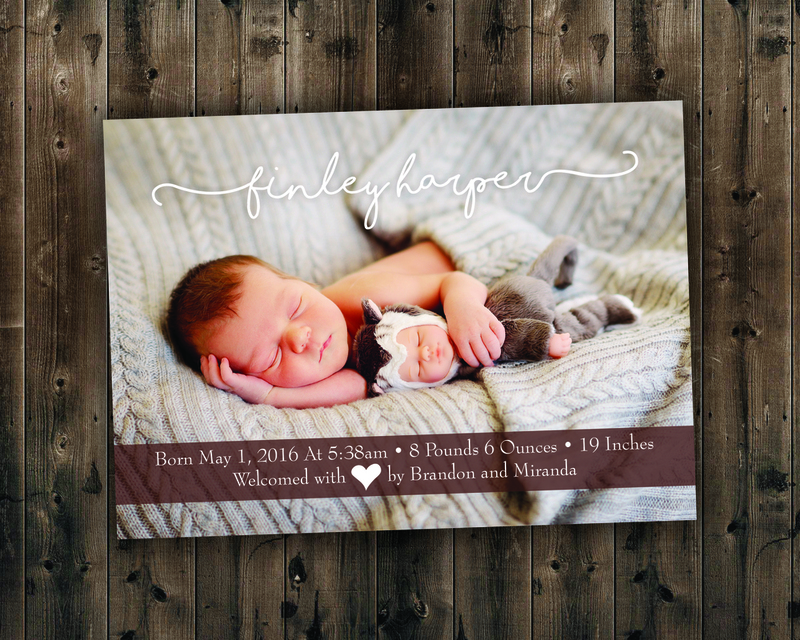 So, we were inspired to create some designs to announce the birth of your baby in an affordable way. 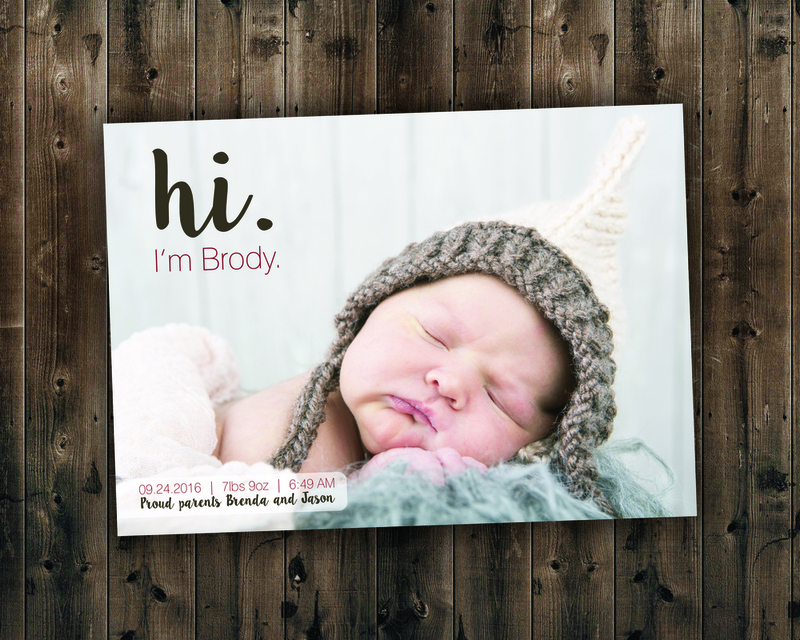 The Birth Announcement package includes a 5 x 7 premium card stock announcement and an A7 envelope. They are $.75 each (with a minimum order of 12). We are having a special on wedding invitations right now through February 15th. Save up to 55% off our normal prices! Get Branded! Your brand printed on your marketing materials. Boy is it COLD outside! It's definitely the perfect time for Bubba's Fire Wood to be marketing. Check out these branded note pads, business cards & invoices we just produced for him. Note pads are a great way to stay in front of your customers as well as potential clients. Give us a call today and we can help you design the perfect marketing materials to help boost your business. 740-877-4428 or email us at info@level33graphics.com. 25% Off on all custom Wedding Invitations orders placed before December 30th. The weekend is almost here. You know what that means... Buckeye Football! Go Bucks! Until then, give us a call and let us know how we can help you with your printing, graphics or marketing needs. 740-877-4428. Columbus brides, we are your source for affordable custom wedding invitations. Don’t waste your money on those overpriced catalogue invitations. Give us a call today and we can work together to create the perfect wedding invitation for you. We offer a full selection of printed materials for your wedding. We would love to help you create the perfect printed products for your big day. Give us a call at 740-877-4428. Check out these cool custom homeschool planners! Let us help you with your C. Give us a call at 740-877-4428. Print IS Big...Check out this cool and informative website about the printing industry. If you need business cards and don't want the cheap, low quality stuff you get online, give us a call at 740-877-4428. Just finishing up another job for Velvet Ice Cream. This one made us hungry! Can't wait to visit their restaurant this summer. Spruce up your business forms! Spruce up your business forms with your brand. 2 or 3 part carbonless forms, we can do that. Thanks RT Electric for your business. Today is the big day! We are officially open for business. Stop in and see us today. 951 Buckeye Ave. Newark, OH 43055.